Clean Carfax, One Owner, Rare Seats/ B & O Combo, 19 Inch Wheels, Back Up, Heated Seats, AWD, NICE! RARE Premium Seat Package, Bang & Olufsen Stereo Pkg, 19" Sport Wheel Pkg, Backup Cam + LOADED. This Q5 checks ALL the boxes we look for in any car, but especially in a Q5 model. First, this is a one owner, west coast vehicle with a clean Carfax and and no blemishes. Not east coast with rust issues, or any damage or accidents with heavy impact. One owner cars are typically in a class of their own when it comes to pre-owned vehicles. They are always in the best shape and seem to run the best. Think about it, The person who spent nearly $60k out the door on this car will always take care of it in a "$60k" type of way. The original owners never forget how much they spent on their car even as it depreciates. The 3rd, 4th, or 5th owners of cars spent a fraction of that on the car, and typically take care of it a fraction of the way. This Q5 is really in a class of its own it you take into consideration the Carfax, the color combination, and most importantly the rare option combinations this particular Q5 comes with. The two options that make this Q5 different from all the rest is the "Sport seat package" and the Bang & Olufson sound system. To have these two options in the same car is extremely hard to find and make for a totally different experience while inside driving the car. After all, the interior is where you reside while you drive the car. The seats have much more bolstering which hug you in your seat much better while driving a little more aggressively. Plus they look soooo much better than the base Audi seats. The Bang & Olufson sound is second to none when it comes to sound systems and is like a live symphony is playing in your car. It is crisp and clear and if you like music which most people do, you will be blown away with the quality of the Bang & Olufson sound system. The 19 inch wheels are upgraded on the premium plus model and look really nice on this Q5. The roof rack is a piece and really completes the look of this Q5 on the exterior. There is also a little bit of factory warranty left and it is much cheaper to extend the warranty while it is still under factory warranty. With the combination of the one owner, clean Carfax, charcoal on black, the seats, the bang, the wheels, and the roof rack, these options and history make it a one of a kind car in the market so dont wait or dont settle for one without all these attributes. It might be "cheaper" but that never means it is a "better deal." Call or email with any questions or stop by anytime to check it out. This is a west coast owned so there is no rust/corrosion issues! Dealers can buy cars from Illinois, New York, East Coast, Midwest Michigan ect with rust for $2500-$5000 less than the same car but from the west coast. Not only is this a west coast car its a 1 owner with no blemishes at all on the Carfax. No accidents or damage reported, minor damages, rental car, or odometer roll backs. 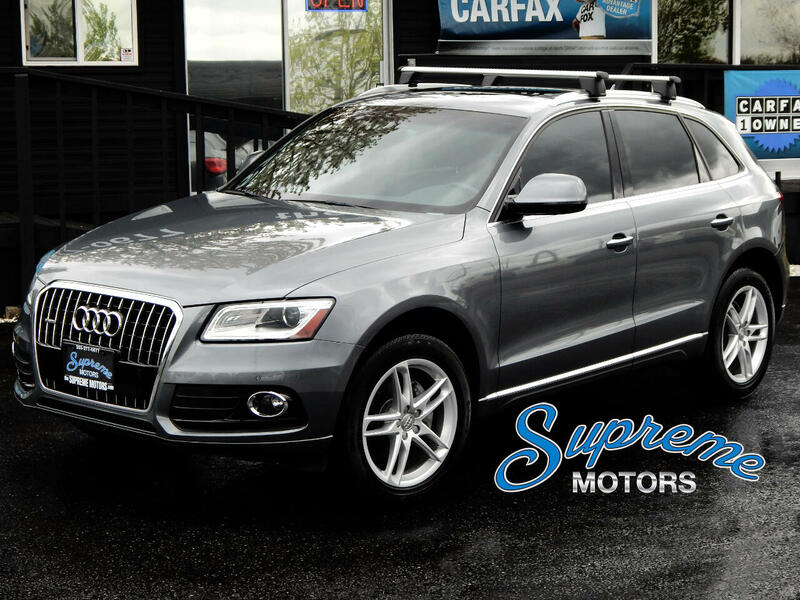 At Supreme Motors, we ONLY sell the best of the best and this Q5 is another prime example of our meticulously inspected, coveted color combination, clean Carfax, and rare optioned inventory that we select for our new clients. We priced this one so aggressive (for what it is) because we only have two owners that do everything. So you not paying for a salesman, manager, receptionist or buyer! We have the best reviews in Washington and sell ONLY the highest quality! The B and O stereo package is a must. If you haven't compared the base package to the Bang & Olufsen package get prepared to be blown away! They are crisp and hit every note extremely crisp. Come on, its Bang & Olufsen! Remember one of the most important factors on any purchase is that it is not an east coast car, Florida, Texas, Canadian, Michigan, Illinois. We dont sell ANY rust buckets AKA most non west coast cars, or cars that the undersides have been painted or had under coating applied to hide corrosion. This assures no rust or corrosion or the chances it was involved in a flood or hurricane. We had to pay over $4000 more for this Q5 because it had a clean history, its black on black, all the options, and the SEAT package! We could have bought a 2015 Q5 in silver with the tan interior, or an accident on the Carfax, from New York (or any rust area), without the seat package, with the exact same miles and WE could have it priced at $22900, but that does not mean it is a better "DEAL". Its just a lower price for a lot less quality. Its a lower price, NOT THE BEST OVERALL DEAL. Its an investment and what you are going to own and drive around for 1-15 years. Buy the right one @ Supreme Motors. We carry ONLY the FINEST! Black on black with EVERY MUST HAVE OPTION, and a clean Carfax from the west coast! THATS VALUE and will ALWAYS be worth more than the questionable rust bucket, car with an accident, or a bland color combination! All vehicle's have been FULLY inspected to insure the HIGHEST quality vehicle's in Washington. Our low overhead and just two owners that work here enables us to UNDERCUT all of the other dealers when it comes to condition, Carfax, Price, Color, and options! We finance @ rates as low as 1.99% & accept trade-in's! Visit Supreme Motors online at -- www.thesuprememotors.com -- to see more pictures of this vehicle or call us at 253-277-0677 today to schedule your test drive. We buy cars that hold their VALUE so that 2 to 3 years down the road you won't have a bunch of negative equity. Straight forward pricing that undercuts ALL of Washington, CARFAX'S (Free on Website), and ONLY the hardest to find Sport and Luxury Vehicle's in this state at ROCK BOTTOM PRICES! The price for this vehicle as equipped does not include charges such as: License, Title, Registration Fees, State or Local Taxes, Finance Charges, Credit Investigation, Optional Credit Insurance, Physical Damage of Liability Insurance, Delivery Fees, or a negotiable $150 Documentary Fee. Dealer Car Search and Dealership makes no representations, expressed or implied, to any actual or prospective purchaser or owner of this vehicle as to the existence, ownership, accuracy, description or condition of this vehicle's listed equipment, accessories, price or any warranties. Any and all differences must be addressed prior to the sale of this vehicle. Call for more details. Message: Thought you might be interested in this 2015 Audi Q5.